Step away from the High Fructose Corn Syrup. I have a way for you to make you own 'almost' maple syrup. It is tasty and it is frugal and it is much better for you than your conventional imitation syrups. 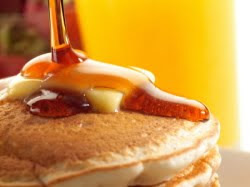 Maple syrup is the way to go if you can get the real deal, but for us, that is PRICEY. So we opt for making our own. White , brown , cane juice crystals , sucanat , whatever you like or have on hand. Most of the time we use sucanat . Now you need 1 cup of water. Pour the water and your sugar in your pot and cook over a medium/low heat until the sugar is dissolved. Once this happens take the syrup off the heat and add a few drops of maple extract . Now this makes a thin'ish syrup and sometimes my children request that it be a bit thicker. When those times come along, I take a bit of arrowroot (about 3 Tbsp) and mix it with just a tad of cold water. Have this waiting for when your sugar and water begins to boil, once it does, add your arrowroot /water mixture and stir quickly.